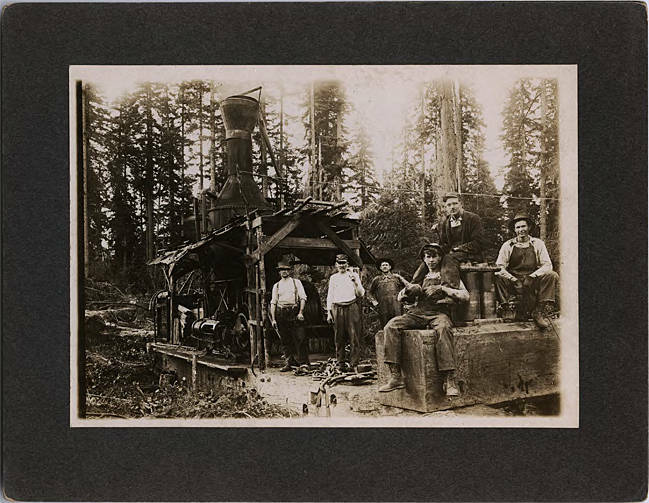 Six men pose in front of a machine in a forest. The machine consists of a boiler with a boiler with a smokestack extending above machinery under a framed porch, and a cable wound onto a spool. The entire mechanism sits on two large, squared off logs that are partially buried in the ground beneath it. A cable runs from a lever extending above the front of the machine out of the image to the right. Three men stand in front of the machine on the foundation logs, large chains with links as big as their feet on the wood below them. Two are dressed in work clothing, light shirts and dark pants with hats or caps. The third man wears overalls and a hat pushed back on his head. In the foreground, one man sits with his feet dangling over the edge of a large log laid across the support logs for the boiler. A man sits on a block behind him, feet dangling over the first man's shoulders. A third man sits on a block nearby. All wear overalls over light shirts, and various styles of hat. Pine trees of various sizes fill the background of the image, and the ground in the left of the image is covered with debris and tree limbs. [Back] Lumber camp near Buxton, Oregon. Third man from left is Lee Deardorff [sic] - about 1913. Uncle Lee's job was running the donkey engine. 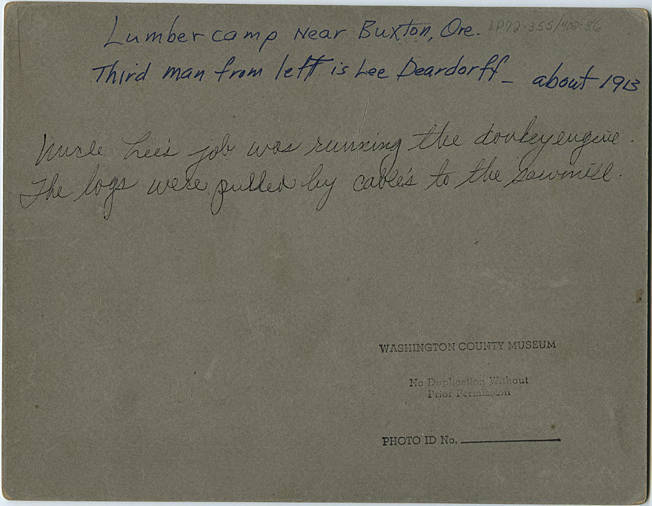 The logs were pulled by cable's [sic] to the sawmill.